Royale 500 online casino definitely strives to mimic the james bond sophisticated vibe. Royale500 Casino is well known for its generous player bonuses and promotions offered to both new and existing players. In addition, its multi-level VIP Lounge, diverse payment methods, and its extensive range of classic and popular casino games available on multiple platforms, including mobile, will make any player feel like they are receiving the royal treatment, every time they play. 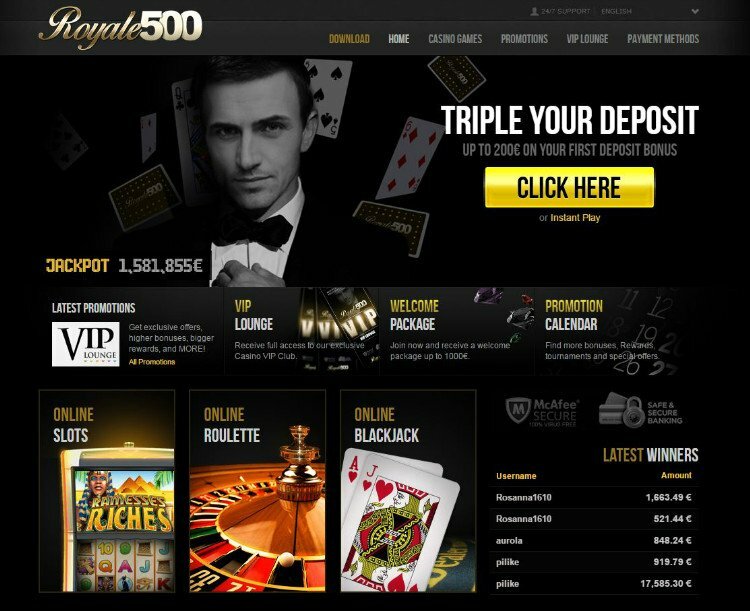 Royale500 online casino features a slick black design that gives the site a high-class appearance and also makes it user-friendly. It provides quality entertainment and excellent bonuses and promotions, which will be discussed in further detail within this Royale500 Casino review. The casino’s impressive and diverse gaming portfolio will more than satisfy the tastes and interest of both new and seasoned players. There is always something fun and rewarding for players to look forward to, including welcome packages, deposit bonuses, tournaments, and a VIP program that can be highly lucrative for loyal players. When it comes to casino games, players will find Royale 500 Casino Games does not disappoint. It offers everything from classic favorites to the latest popular casino game trends. Discover a huge collection of slot games featuring 3D, progressive, 3-Reel and 5-Reel slot machines. Players, who are interested in more than spinning reels will also find different variants of card and table games including Blackjack, Caribbean Poker, Punto Banco, and Baccarat. There is also Roulette, Video Poker, Scratch Games, Hi-Lo, Big Wheel, Roll A Ball, and Doubles Heaven. In addition, players can engage in live casino games and test their luck at live versions of Blackjack, Baccarat and Roulette, while they interact with a human dealer in real time. Players can access games via different platforms. They can download the casino, choose Instant Play, accessing games directly from the web and, those who are on the go, can enjoy Royale500 mobile casino. Games can be enjoyed in both real money and fun mode. Royale 500 online casino definitely strives to mimic the james bond sophisticated vibe and it mostly succeeds. Promotions will not disappoint players who like to play at online casinos that offer large rewards. Royale 500 no deposit bonus is replaced with a points system for loyal players and the brand welcome bonus is one of the biggest in the industry. On their first three deposits, new players can receive a bonus that totals up to $1,000. 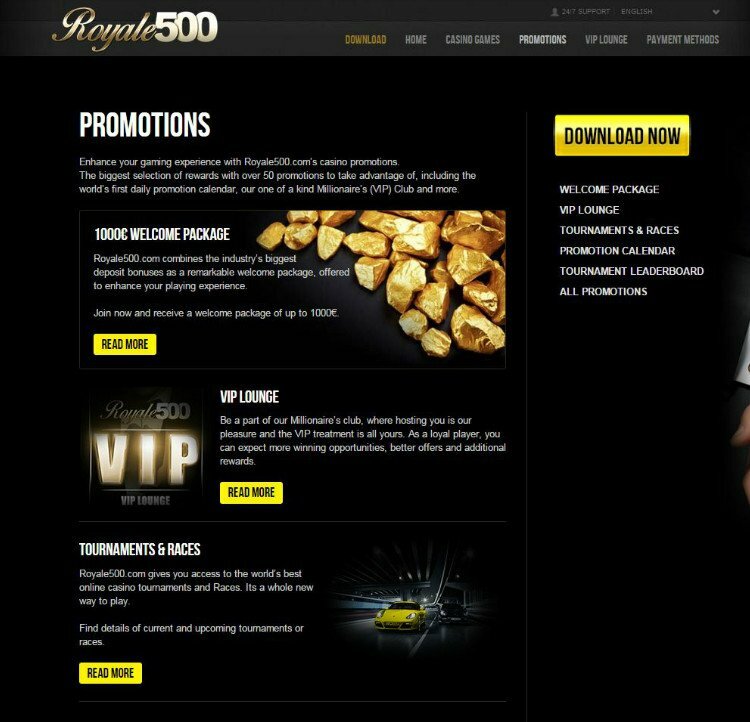 Existing players can benefit from other Royale500 promotions, some of which are offered on a weekly or monthly basis. For instance, Realkick gives players the chance to win a share of $500 simply by playing the special game of the week. 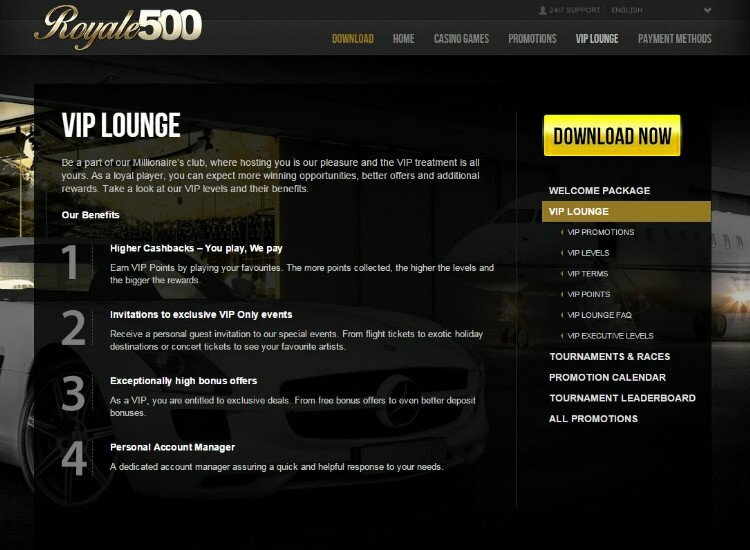 There are also Tournament & Races, as well as a VIP Lounge that consists of multiple levels, each of which entitles VIP players to exclusive perks and promotions. The best way to keep up to speed on the casino’s current rewards offerings is to check out its promotions calendar. There are many Royale 500 payment methods. Therefore, no matter your preferred method of payment, you will be able to choose from a diverse selection of flexible banking options including credit cards, debit cards, prepaid cards, bank transfers, and digital wallets. Some of their payment methods include: Visa, MasterCard, Click2Pay, iDEAL, Neteller, PayPal, Ukash, Skrill and so on. Royale 500 is always adding new games to its database. Some of the latest titles that have been added to their collection include exciting 3D slots. The customer support at Royale500.com is available 24 hours a day, 7 days per week. It offers limited support options. Players can contact customer support via email and through live chat. The site supports multiple languages including English, French, German, Italian, Spanish, Swedish, Russian, Portuguese, Polish, Hungarian, Norwegian, and several others. That being said while they do offer support in multiple languages, players who wish to write to customer support are recommended to do so in English. Royale500 gets 5 stars from me because it not only has a GREAT variety of games but its got scratch games, I LOOOOOOOVE scratch games!! I particularly like the table games that this Royale500 offers. They offer a huge selection of slots titles too, but I tend to gravitate more toward the less common card games like Caribbean Poker and Casino War. I always like online casinos that cater to the interests of different types of players. This is one snappy looking casino! I feel like I’m rich when I play there haha and I really like its multi-VIP levels.